Hull City and Scotland midfielder Robert Snodgrass expects Dundee defender James McPake to "come back fitter and stronger" from his knee injury. 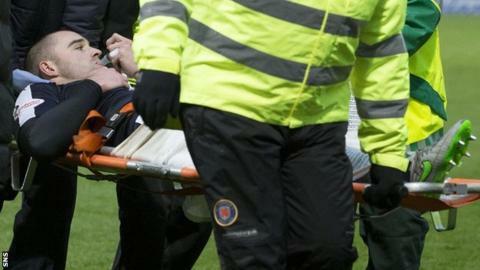 McPake, 31, sustained a suspected dislocated knee during Saturday's derby win against Dundee United. His former Livingston team-mate Snodgrass dislocated a kneecap in 2014 and returned to playing in December. "He's had some bad injuries but he's always come back," Snodgrass, 28, said. "James has been through it before when we were at Livingston. He broke his leg and James has got a great mental strength. "He doesn't leave a stone unturned, he works so hard off the park and I think that'll be no different. "He'll come back fitter and stronger and I wish him all the best. He's such a good pro and good guy and you want to see guys like that playing football." McPake is due to have an MRI scan on Monday. "What James will probably need to do now is let it settle down," Snodgrass told BBC Radio Scotland's Sportsound. "The scan will maybe show the damage because when there's too much swelling in there, it's quite hard to see. "Even when the surgeon goes in to do any sort of operation, he might see something in there and that's exactly what happened with me." Fifteen-times capped Snodgrass last played for Scotland in a friendly win over Norway in 2013 and the former Leeds United and Norwich City player is hoping to get back involved in the international set-up. "The best I'm going to get out of myself is by playing games," he added. "The big thing was to try and get back and then get back into the Scotland set-up and obviously start off the [World Cup qualifying] campaign and try and do well. "I've worked really, really hard to get back."